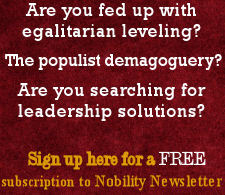 How did St. Nicholas evolve into Santa Claus and why? Four artists, working with stories handed down, are responsible for the Santa Claus that we know today as the “spirit of generosity and love.” The other reason we have Santa Claus and not St. Nicholas is due to Protestant hatred against Catholic Saint days. 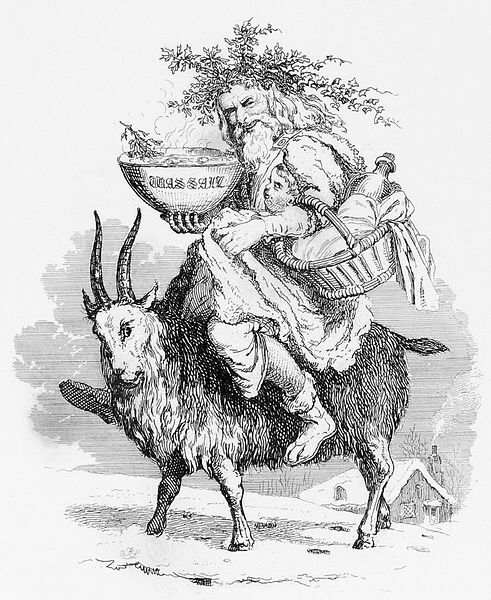 The transformation of St. Nicholas into Father Christmas or Father January occurred first in Germany, then in countries where the Reformed Churches were in the majority, and finally in France, the feast day being celebrated on Christmas or New Year’s Day. 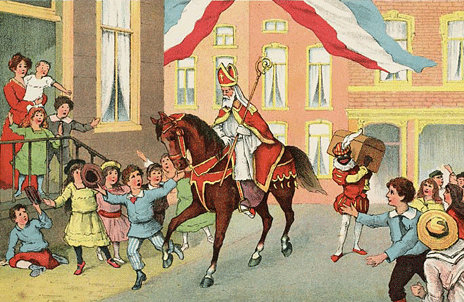 Dutch Protestant settlers in New Amsterdam (New York City) replaced St. Nicholas (Sinter Claes) with the benevolent magician who became known as Santa Claus. 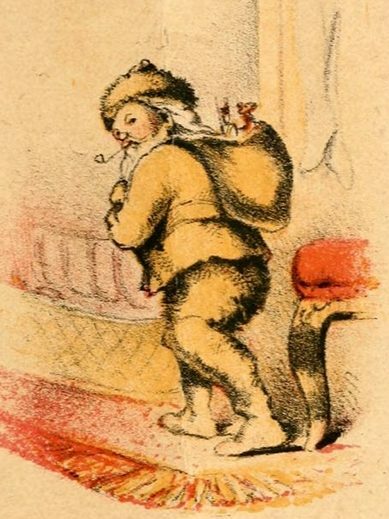 Victorian depiction of Father Christmas. In 1517, the Protestant Reformation took place. Protestants do not believe in Saints. However, St. Nicholas was so beloved by everyone that people held onto his memory of being generous and loving, but they did away with the Catholic influence by creating new characters based on him, like Father Christmas or Pére Noël. In the Dutch legend Sinta Claes and his original elf, Black Peter, a small Moor, leaves Spain in their rowboat on St. Nicholas day, December 6, and heads for Amsterdam. After landing on Christmas Eve with gifts, he asks parents if their children have been good or bad. If good, gifts go in their shoes; if bad, lumps of coal instead. When Dutch settlers, who were predominantly Protestant, came to New Amsterdam (New York) in the 1600’s, they brought their version of “St. Nicholas” with them. With a few modifications and through bad pronunciation of Saint Nicholas, his name was changed to Sinta Claes and Black Peter was dropped. 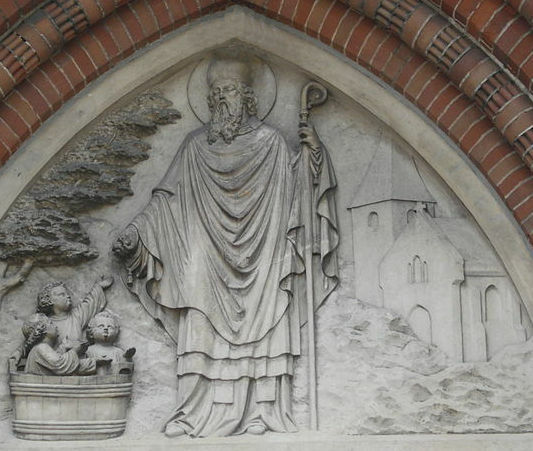 Saint Nicholas and Black Peter, also known as Sinta Claes. In 1820, the first of four artists, Washington Irving, a very popular writer of his day, wrote a book of political satire that talked a lot about Sinta Claes, or Santa Claus. In it, he made Sinta Claes without a donkey or a white horse and put him in a horse-drawn wagon that flew over rooftops dropping presents down the chimneys of good children. Irving’s Santa was a jolly fellow with a wide hat and baggy trousers. That Santa’s garb and means of transportation didn’t last long. 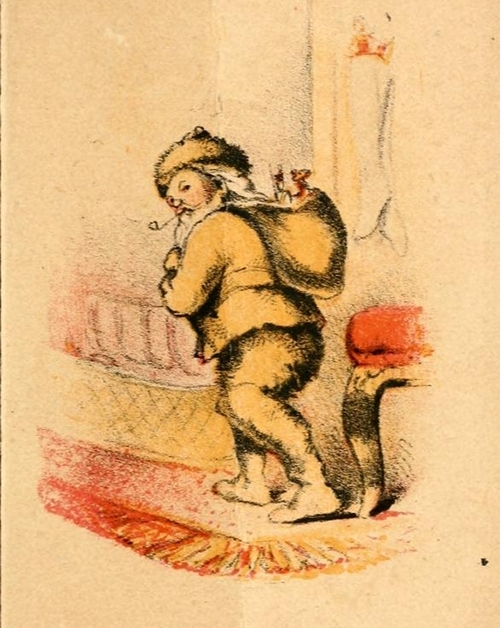 Illustration from the 1864 edition of Clement Moore’s poem A Visit from St. Nicholas. 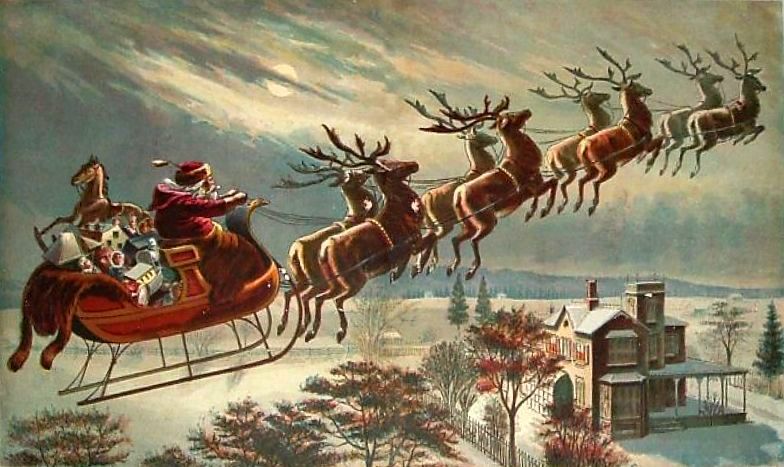 In 1823, the second artist, a professor by the name of Doctor Clement Clarke Moore, presented his family with a poem about Santa to amuse his grandchildren and that Santa took over. The poem was A Visit from Saint Nicholas which began, “Twas the night before Christmas….” The poem quickly became popular around the United States. Clement Moore’s poem had used the description of Santa in Washington Irving’s book but he added new details. He turned him into jolly Saint Nick, a plump, happy-go-lucky elf that could squeeze down a chimney or two, with a sleigh full of toys, eight flying reindeer and he moved his home from the Mediterranean area to the North Pole. Santa with eight flying reindeer. 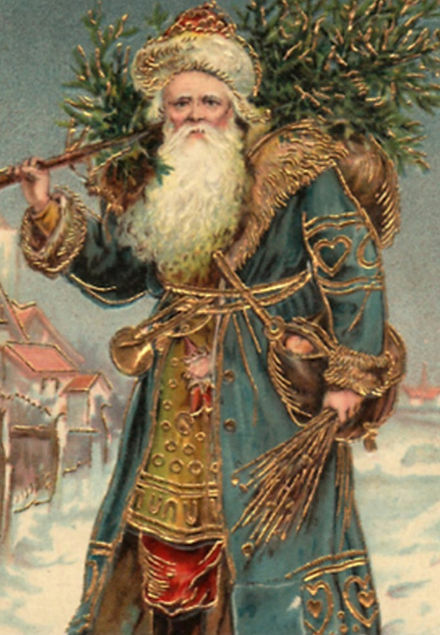 Santa Claus was often shown dressed in green clothes, or blue or black. When one of Clement Moore’s daughters did a calligraphy version of her father’s famous poem as a Christmas gift to her husband, inspite of her father’s words, she dressed Santa Claus in a long green coat. Santa stayed an elf until the 1860’s. That is when he got fat again. In 1882, the third artist, Thomas Nast, drew whom he thought Clement Moore was describing. It was published in a newspaper called Harper’s Weekly. 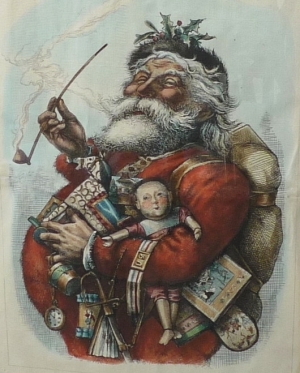 Thomas Nast, an illustrator for Harper’s magazine, pictured a round Santa. He also drew Santa’s map, giving Santa a North Pole workshop and home. He also made this Santa have a worldwide list of good and bad children. This version of Santa Claus lasted until the 1920s, when advertising got involved. 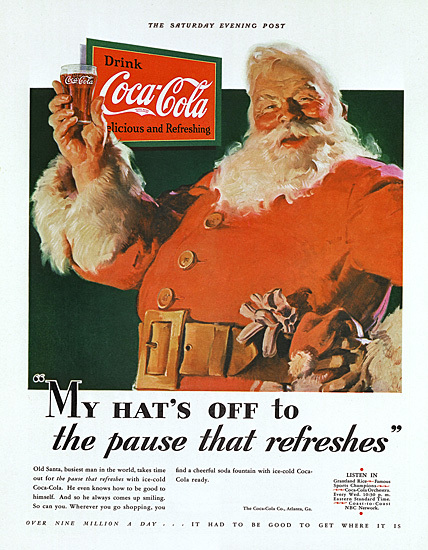 First Coca-Cola Santa in 1931 created by Haddon Sundblom. The last artist, Haddom Sundblom, worked for the Coca-Cola Company and drew its posters and advertisements. Haddom Sundblom decided that Santa wore red and was not really an elf. He also made Santa drink a Coke. This Santa Claus was made in the early thirties. The red-velvet-wearing, bigger-than-life Santa that Haddom Sundblom designed for advertising 80 years ago is how most people think of Santa Claus today. 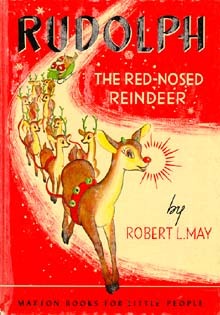 Cover of one of the 1939 books of the Robert L. May story by Maxton Publishers, Inc. In 1939, Santa picked up the ninth reindeer, Rudolph; that red-nosed reindeer was created by an advertising writer for Montgomery Ward.